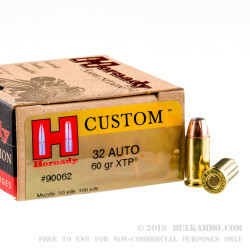 Hornady’s XTP or Extreme Terminal Performance ammo is just as famous as its maker is, if not more. The most easily recognizable part is the interestingly designed hollow point that, when it hits soft tissue, tend to spread out into a "star" or "gear" type of shape. This, in addition to its massive stopping power, is a popular design for many Concealed Handgun Licensees. 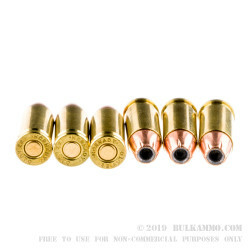 In fact, the .32 ACP (Automatic Colt Pistol) round has gained so much popularity over the last few years, that the bullet design and manufacturing technology are already being applied to it in large numbers. With its controlled expansion, fully encased lead core, jacket thickness variables, and its many other features, the XTP bullet has rapidly become a go to round for many shooters. 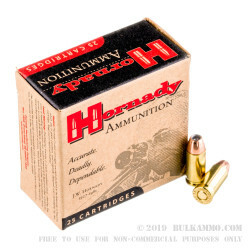 Hornady's .32 ACP 60 grain JHP (Jacketed Hollow Point) rounds are loaded into a heavy-duty, thick wall, new, reloadable, Boxer primed, yellow brass shells. The muzzle energy these rounds produce reports 133-foot pounds, and they also have a decent muzzle velocity of 1000-feet per second. 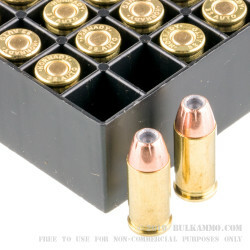 These rounds come in the smaller 25 round boxes that are perfect to take with you to the range. These rounds are also a great pick for a self-defense cartridge, a day of plinking with your family, any shooting competition, and so one. Get your Hornady XTP ammo today so you're ready for your next challenge.